Before purchasing a product please read the instructions on downloading e-products within 48 hours. Based on a sense-making framework called Mental Nutrition, and a career management perspective, this edition shows you how to manage your public sector career, how to write evidence-based, results-focused, job-matched résumés, applications and EOIs, and how to present a convincing case at a job interview. Not researching and analysing the job description. Not knowing what you have to offer. Not knowing how to read a capability framework. Not writing an expression of interest that makes a case for a job. Not tailoring a résumé to the job. Not strategically preparing for an interview. Not mastering interview language practices. Ideas on responding to six challenging interview questions including difficult people, leadership, and strategic thinking. Values-based management: changes across jurisdictions, ethical issues, engaging with risk. Tools include 120 informal role terms and 550 action verbs to use in applications. Read the Table of Contents to see the breadth of this new edition. Author: Dr Ann Villiers is Australia’s only Mental Nutritionist® specialising in the sense-making process. Ann has interviewed hundreds of applicants and coached numerous people to greater application and interview confidence. Dr Villiers is a career coach, professional speaker and author who delivers workshops in applying for jobs and selecting staff. Awards: How to Write and Talk to Selection Criteria, Fifth edition, received Highly Commended in the 2012 Non-Fiction section of the ACT Writing and Publishing Awards. 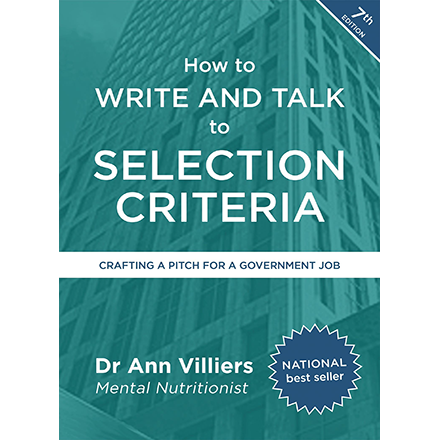 How to Write and Talk to Selection Criteria, Fourth edition, received Highly Commended, in the 2006 Non-Fiction section of the ACT Writing and Publishing Awards.